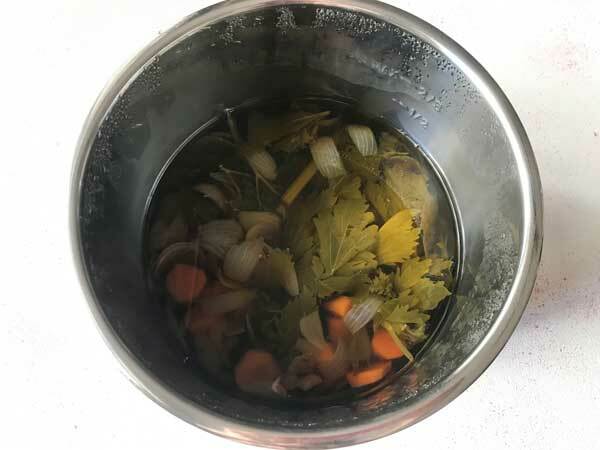 Call it a Vegetable Stock or a Vegetable Broth, here is the delicious recipe with easy steps to follow. A great way to utilise all the vegetables and its scraps. Deepen the flavours of soups, stews, pastas, or rice with this amazing homemade stock, that is cheaper and better than store bought. I remember the time many years back, when I was habitual to buy to stock cubes from supermarket. Roughly around 13 years back, when I was surfing some recipe that was using homemade vegetable stock. That moment I realised, unnecessarily I was spending so much on those store bought stock cubes. OMG! making it at home was so simple and easy, required no effort at all. Making vegetable broth is one of the easiest thing you can do in your kitchen. Throw in everything in the pot or an instant pot along with spices and herbs of your choice. Then, cover them with good amount of water and simmer it for at least 40-45 minutes. Isn’t that so simple and easy? 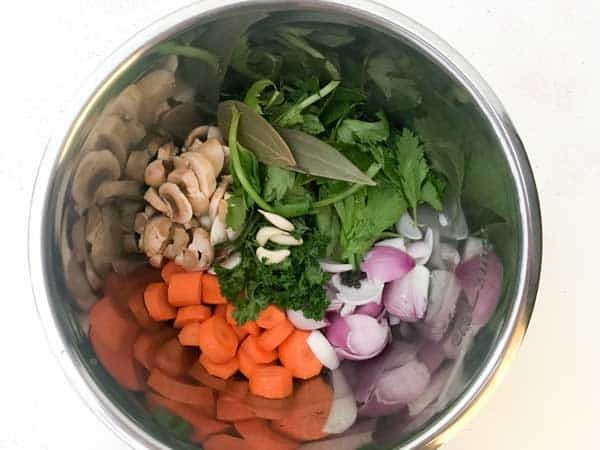 Today, I shall be showing you, how to make vegetable stock using veggies scraps as well as veggies in instant pot and on stovetop. What veggies should be used to make best vegetable stock? Ideally, the combination of onions, celery, carrots, garlic, ginger, leeks (optional), mushrooms works best. Whenever I plan to make stock, the above mentioned veggies are my choice. Note: If you are allergic to Mushrooms, then skip adding it. Can we use veggie peels (skins) to Make the vegetable stock? Yes, of course! Using vegetable peels and skins to make vegetable broth is the best part I love to do. Onion skin, potato peel, carrot peel, peas peels, cauliflower or broccoli stem, bottle gourd peel, fennel bulb ends and many more are good to go for the recipe. 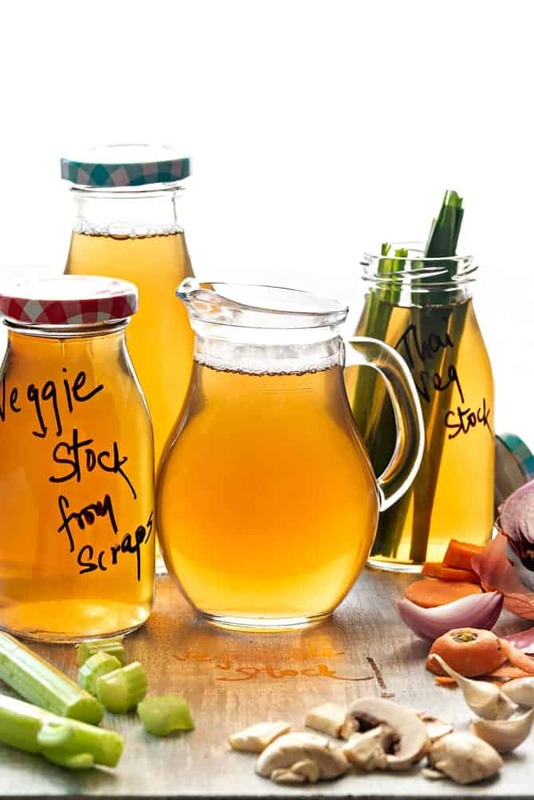 Scroll down to check on how to make vegetable stock from scraps. Onions, garlic, carrot and celery are key ingredients for best vegetable broth. But, if you don not have the access to celery, then you can skip it. Always simmer the broth for at least 45 minutes. Usually, I go with an hour of simmering it as well. Cauliflower florets, broccoli florets, cabbage and other cruciferous veggies over power the flavour of the stock. 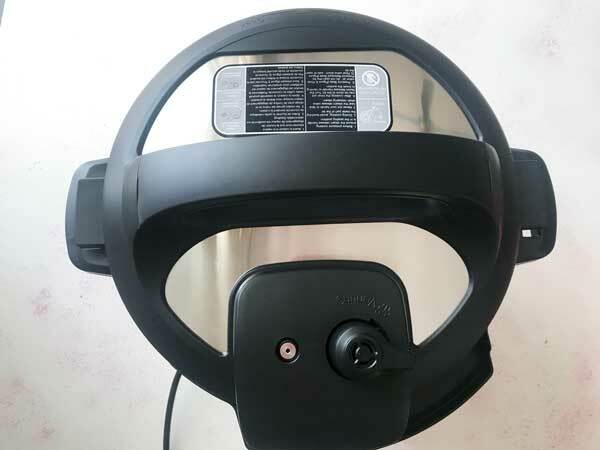 Therefore, either avoid it to use them in lesser quantity. Avoid using green beans as long hour of simmer imparts slight bitterness to the stock. Also, avoid using to many starchy vegetables like potatoes or squash, However, you can add their peels as it give lovely flavour and body to the broth. When making veg stock using peels, do not forget to wash them well before adding them to the pot. 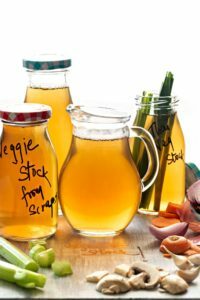 How to Store Homemade Vegetable Stock? Homemade vegetable broth lasts for up to a week in refrigerator. Once the vegetable broth is ready, cool it down, strain it and then pour into clean air tight glass jar to container. The another method to store them is, pour the prepared stock into ice cube tray and freeze it. Either, let them sit frozen in an ice tray or later take out all the cubes and store in a clean ziplock or container. Use as and when required. It stays good up to 6 months. 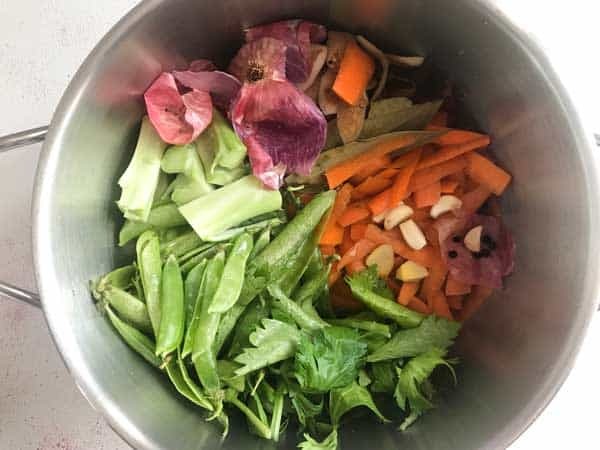 To make Thai flavours broth, add some lemon grass, galangal, kaffir lime leaves and some fresh coriander root and stem along with the other veggies. For Chinese flavours broth, add star anise, some Chinese cabbage, some scallions, along with a 2 teaspoon of soy sauce. 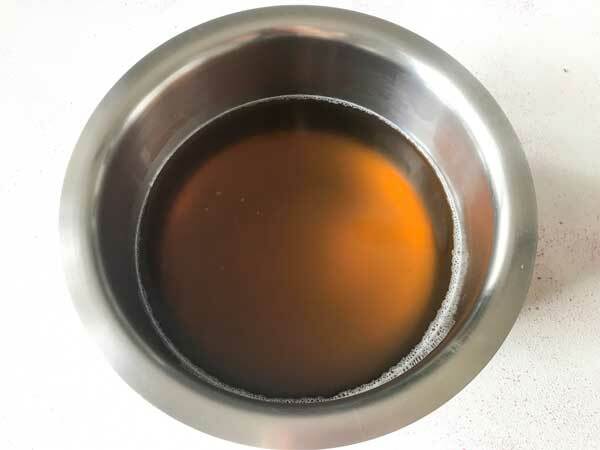 This homemade vegetable stock is so amazing to add as a base to gravies, chinese soups like clear soups, wanton soups, ramens, hot and sour soups, noodles soups and so on. Or add dried Kombu kelp to get umami flavoured vegetable broth as the base for Asian recipes. How to make Vegetable Stock from Scraps? I have been following the practice of making veggie stock from scraps since years. Yes, never ever throw away the vegetable peels, roots, leaves, trimmed ends, stalks. 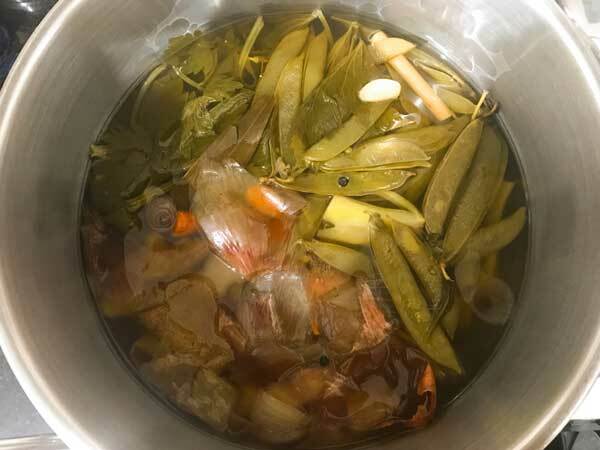 And it would not at all be wrong to say that these kitchen scraps gives the best of the flavours and nutrition to the vegetable broth. What you can do is, daily, give the nice wash to the scraps, pile them in a container and refrigerate or freeze them. Once you are good to go to make stock in the bulk, throw everything in the pot and proceed. To begin with, add 4 cups of veggies scraps (peels, cuts, ends, leaves, stalks) along with bay leaves, pepper corns, ginger and garlic. Add 8 cups of water and place the pot on stovetop. Bring it to a boil on high flame, then cover and simmer on low flame for at least 45 minutes to 1 hour. • You can also add mushrooms along with the peels. Once the stock is ready, allow it to rest for 15-20 minutes. 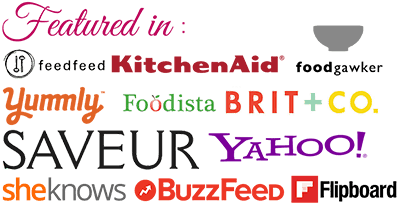 Strain and use to make curries, gravies, stews, pastas and so on. 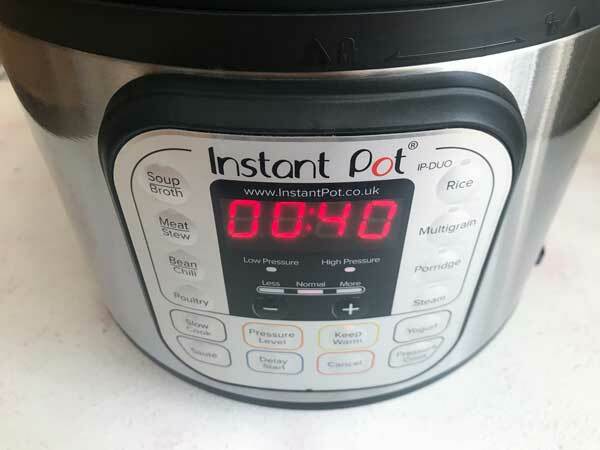 Do you know what is the best part of using an instant pot (IP)? It is the one equipment that do not require baby sitting to make anything in it. Dump the veggies, scraps, throw-in the herbs, add water, set the timer, it back and relax! 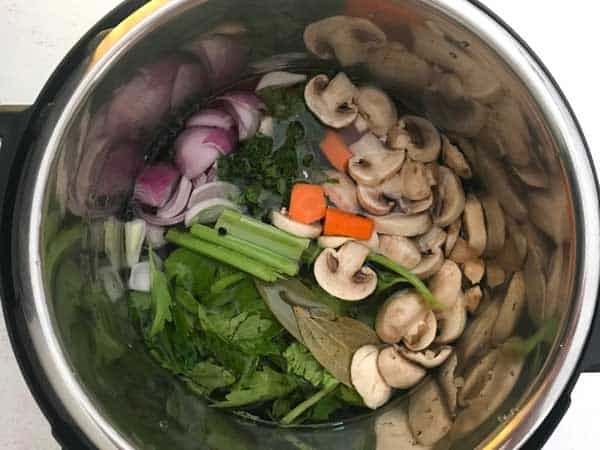 Instant Pot Vegetable Stock is ready to use. To start with, add sliced mushrooms, roughly chopped carrots, roughly chopped onions, Celery stalks and leaves, parsley, garlic, bay leaves, black pepper corns in the pot of instant pot. Add 8 cups of water to the pot. Put the lid of the pot and close it with pressure valve in sealing position. Set the timer and pressure cook on high for 40 minutes. Now, strain the stock using strainer to cheese cloth. Vegetable Stock is ready to use. 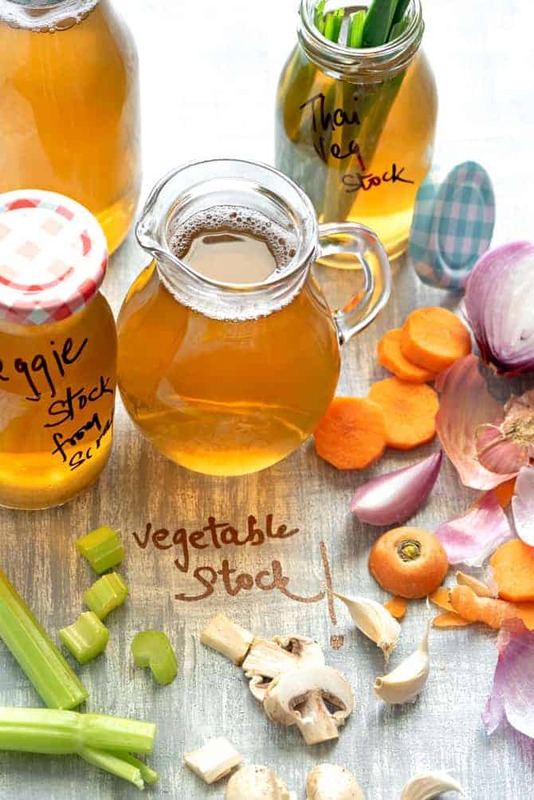 Have you tried this “Vegetable Stock Recipe”? Please feed us with your ★ star ratings and comments below. Heres is the delicious One pot homemade Vegetable Stock recipe with easy steps to follow. A great way to utilise all the vegetables and its scraps. 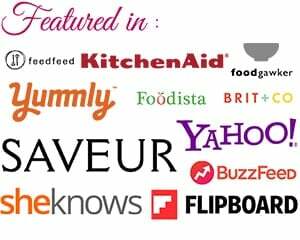 Make it on stovetop or instant pot, it is so simple, cheaper and better than store bought. To begin with, add 4 cups of veggies scraps (peels, cuts, ends, leaves, stalks) along with bay leaves, pepper corns, ginger and garlic in the pot. Add 8 cups of water and place the pot on stovetop. Bring it to a boil on high flame, then cover and simmer on low flame for at least 45 minutes to 1 hour. 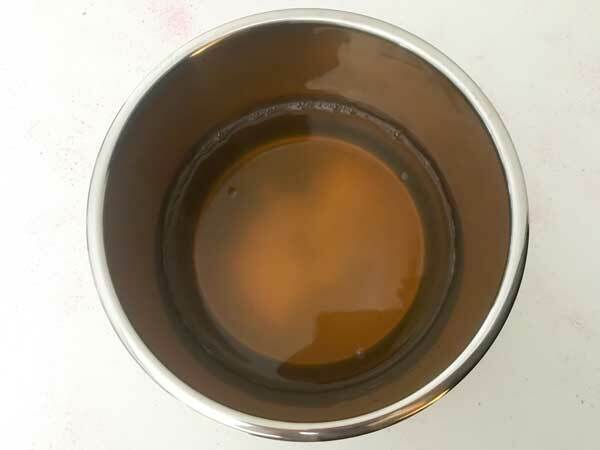 Add 7-8 cups of water to the pot. Allow the pressure to release naturally and open the pot. You can add any veggies of your choice to make the stock. Also note that, if you are using dried herbs then strain the stock using very fine strainer to strain all the dried herbs. This is a fabulous way of using kitchen scraps. Thanks for sharing Farrukh!